Hello, fall! From deeper hair shades to scores of gorgeous suede booties, we’re embracing all that the new season has to offer (even if the Midwestern weather doesn’t always cooperate). But with every new season comes new beauty trends, and sometimes, integrating them into your everyday style can prove difficult. Don’t get us wrong, we love runway beauty—but pulling off those ultra high-fashion looks in real life just isn’t achievable for most of us. So, to help you make the seamless transition this season, we’ve put together a list of looks you’ll actually want to wear. One thing is clear: strong eyes are in. From bold shadow to winged liner, spotlight-stealing eye makeup is making a splash this season. This look will be all around this fall for a reason: they look gorgeous and make a strong, empowering statement. 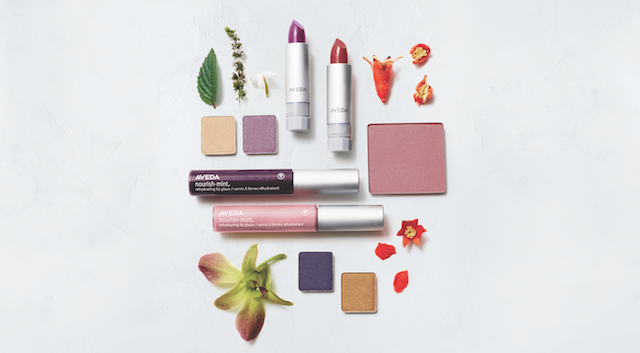 When it comes to color, many of our favorite fall shades can be found in Aveda’s Birds Eye collection. Inspired by the plumage of exotic birds, these jewel tones are perfect for adding a splash of color to monochromatic cold weather wardrobes.. Whether you go dramatic with coppery metallics or stick to subtle rose tones, these colors help take your autumn look to the next level. From A-list celebs to fashion runways to your best friend, expect to see plum popping up everywhere this fall. It’s rare to find a shade that truly looks good on everyone, but this might be it: no matter your skin tone or hair color, plum is always a perfect choice. We’re loving Aveda Petal Essence Single Eye Color Fjord, a stormy, blue-toned shade, and Mauve Quartz, a less saturated, dusty alternative. Apply heavily to drum up a dramatic look or apply with a light hand for just a hint of color. And if you’re feeling extra bold, try Nourish-mint Rehydrating Lip Glaze in Mulled Plum, sheer, midnight purple. It’s surprisingly flattering, and bonus: blue-hued lip color makes your teeth look whiter, too. Good news for those of you who’ve mastered textured waves: they’re here to stay. This versatile look has earned its lasting position at the top of the trend list—and has even become, dare we say, iconic. Beachy, effortlessly chic waves work well on all lengths and textures, which definitely adds to their appeal. For help achieving the look, try Aveda’s new Texture Tonic. It uses Epsom salts—rather than drying sodium chloride, which most brands use—along with organic cane sugar to add touchable texture (read: no crunchy feeling). Just apply to damp or dry hair from mid-length to ends for a piece-y, lived-in look. And did we mention it’s 94-percent naturally derived? Need help making these looks happen? The team at Indira Salon Spa is here to help. Stop by for product and styling advice, or visit us at indirasalonspa.com to book an appointment!